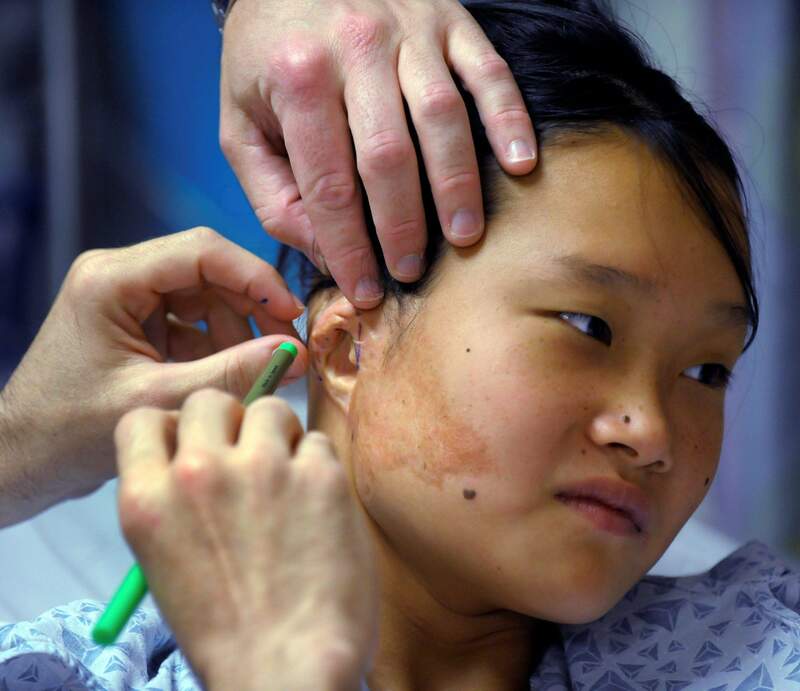 Elise Lutz looks into a mirror and admires her new prosthetic ear Nov. 24 at the Anaplastology Clinic in Durham, N.C.
Photo surgeons make surgical marks around the deformed ear of Elise Lutz, 14, during her pre-operation exam June 23 at Duke University Medical Center in Durham, N.C. Lutzs surgery involved two primary surgeons to remove the tissue and cartilage from her deformed ear, then insert titanium rods into her skull. The rods will eventually hold her new prosthetic ear. Elise Lutz is fitted for a new prosthetic ear June 7 at the Anaplastology Clinic in Durham, N.C.
Anaplastologist Jay McClennen attaches Elise Lutzs new prosthetic ear Nov. 24 at the Anaplastology Clinic in Durham, N.C.
A prosthetic ear made for Elise Lutz at the Anaplastology Clinic in Durham, N.C., is ready for use. 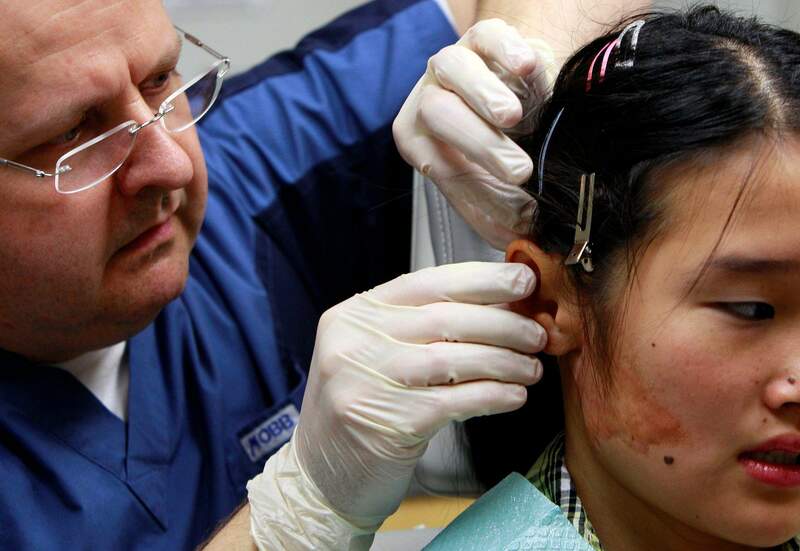 Photo anaplastologist Jay McClennen holds Elise Lutzs new prosthetic ear near her good ear prior to attaching it Nov. 24 at the Anaplastology Clinic in Durham, N.C.
Elise Lutz never let her friends see what was left of her ear. Shed carefully style her long hair into a one-sided ponytail, or swelter under a swim cap for hours at meets, to cover the molten lump from a severe burn as a toddler in her native China. Elise benefited from a little-known field called anaplastology, where medical artists make Hollywood-like special effects come alive to fix disfigurements that standard plastic surgery cannot. It kind of took forever, but it was worth it, says Elise, 14, as she headed to show her transformation to her dad and sisters. No messy glue-on prosthetic that she might accidentally knock off. Elise had tried that once and hated it. This time, she would go under the knife to have rods implanted in her skull to snap her new ear into place  and hold it even when this passionate swimmer dives into the pool. 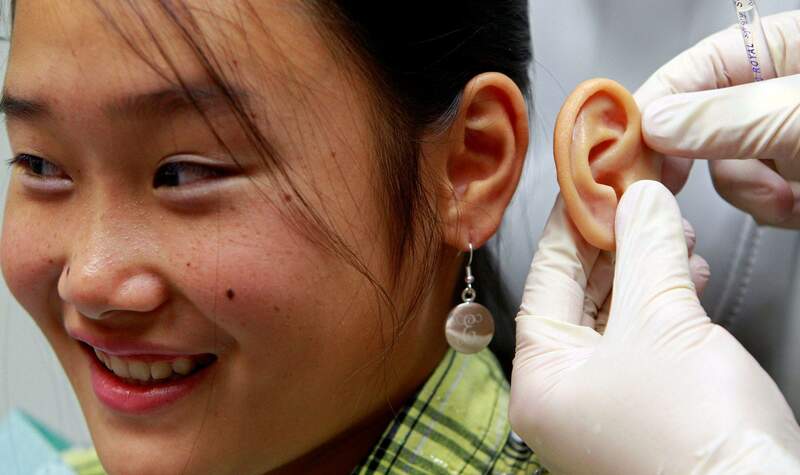 People who have implant-retained ears or noses or whatever usually think of them really as their own body, says Jerry Schoendorf, who with his colleague at The Anaplastology Clinic in Durham, N.C.  and surgeons at nearby Duke University Medical Center  created Elises ear. Its the Rolls Royce of what we can offer, adds fellow anaplastologist Jay McClennen. Facial prosthetics  made to counter damage from cancer, trauma, birth defects  havent gained the attention of artificial legs and arms. The specialists who craft them can be hard to find: The International Anaplastology Association counts just 150 members worldwide. But facial prosthetics are becoming more realistic and longer-lasting, and Elises journey offers a glimpse of the tricks that help: Titanium rods adapted from dentistry that bond with bone to hold them in place. More flexible silicones. Even flocking, using those nylon particles that make the velvety insides of jewelry boxes can help give silicone skin more dimension  and not in flesh tones, but flecks of bright reds, plums, blues, oranges. Patients cant believe all those colors go into making that skin, says McClennen, who now fixes faces using techniques honed in previous careers to age actors in the movies, and in forensic reconstruction. 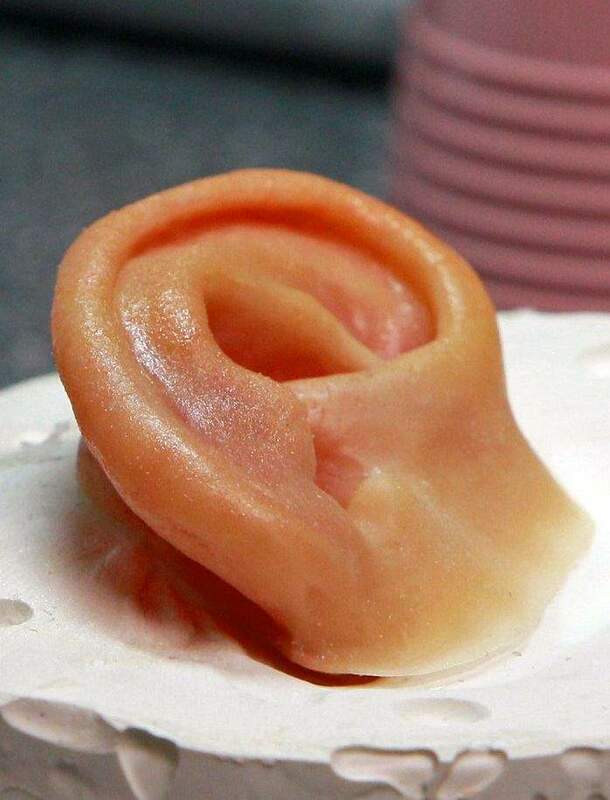 Plastic surgeons started but abandoned ear reconstruction. Prosthetics made to glue on daily are a more common option, especially for cancer patients whose doctors need to regularly check for recurrences. But that didnt work for Elise. Her scars interfered with a straight fit, and crusty adhesive lined edges where she didnt clean the prosthetic well enough. In June, Schoendorf and McClennen made a precise mold of where a new ear implant would need to fit. With the residual ear tissue carefully removed, Duke otolaryngologist Dr. David Kaylie then drilled tiny titanium posts into Elises skull. They barely emerge from the skin. Back at The Anaplastology Clinic, McClennen was sculpting the ear that eventually would hook onto those rods with a mere three clicks. Elises has a bar on the back to snap it on; noses especially are starting to be made with magnets for attachment. Coloring brings out the true art. In the 1990s, as part of a team working on movies like Nixon and Legends of the Fall, McClennen learned to impregnate colorless silicone with a mix of colors so the finished prosthetic required only thin glazing and not heavy paint. 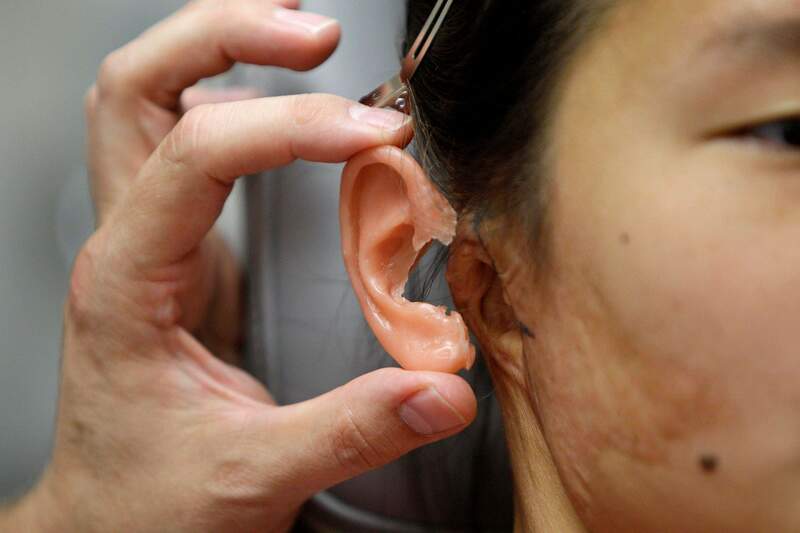 Harder acrylic threaded through the rubbery silicone like cartilage holds the retention bar and, with a technique gleaned at a cancer center in Toronto, McClennen used the right color to mimic that red glow when sunlight shines behind the ear. The day before Thanksgiving, Elises new ear is ready to attach, complete with earring hole. 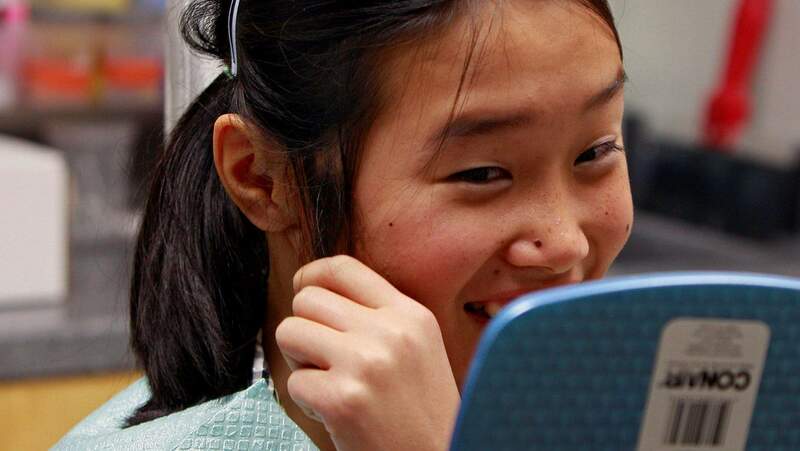 She practices clicking it on, surprised that its easy, and smiles into the mirror, hair tucked back. This one looks fantastic, she later proclaims.